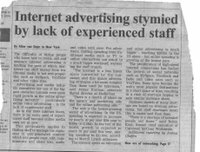 There was an interesting article in the Financial Times of August 30 about the fact that lack of experience staff is the main limiting factor of Internet advertising. Since the begining of Q2/2006, I have been studying the business of marketing services with a focus on how they are changing because of the Internet and I am not that surprised by the FT's account. At least one of my customers will be very pleased to read this article ;-) It says a lot about the relevance of providing next generation marketing services in today's market.